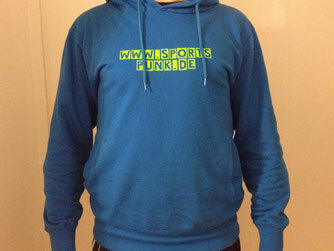 The Sports.Punk sells Shirts and hoodies in his own shop. Naturally this apparel is made of organic cotton. To provide my readers with nice, cool and sustainable sportswear, I am now selling T-Shirts and -brand new- hoodies with my logo. Why is it sustainable to sell stuff like this? -Because it is made of organic cotton and produced in Turkey. So production standards are related to social and environmental circumstances on a European level. This is still no functional sportswear. But once I find a way to provide you with biologically and socially fair made function sportswear, I will do so. For the time being these are two products which at least help you to wear cool apparel before and after sports. This is the link to get to my shop. You are so interesting! I don't suppose I've truly read through anything like this before. So good to find another person with unique thoughts on this subject matter. Really.. thanks for starting this up. This web site is something that's needed on the web, someone with a little originality! Hi there! This blog post could not be written any better! Reading through this post reminds me of my previous roommate! He constantly kept talking about this. I will send this article to him. Fairly certain he's going to have a very good read. I appreciate you for sharing! I am actually thankful to the owner of this web site who has shared this enormous post at at this place. Amazing! Its actually remarkable piece of writing, I have got much clear idea concerning from this piece of writing. whoah this weblog is excellent i really like studying your articles. Keep up the good work! You understand, lots of persons are hunting around for this information, you could help them greatly.